We are in MAY – trade show season is almost over and I am not on a cross border bus as I record today – though I am crossing into Hong Kong tomorrow for a day or 2. 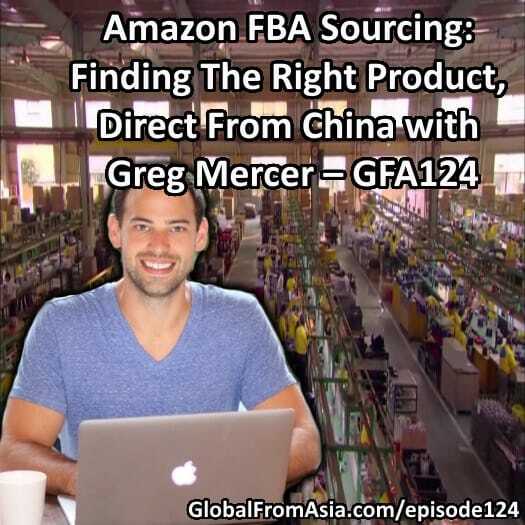 And now this week’s show is going to be quite a special one – we have Greg Mercer, CEO of JungleScout giving us some tips on finding the right product to sell on Amazon, with a special focus on Chinese suppliers. There are a few good blog posts we reference, and you can get the notes and links on today’s episode by going on over to Globalfromasia.com/episode124 He drops great value on this show and holds nothing back – so without further ado, let’s get in! What is private label (or white label)? What is a price you should be look for? How important is it? What is an MOQ that is reasonable, and how many should you buy from the Chinese factory? Enhancing your China trade show experience with Junglescout and mobile apps and the internet. Thanks Greg for coming on and sharing! Hope to catch up with you when I get to Barcelona in June – will be in town for the DC BCN, the Dynamite Circle european conference for about a week.